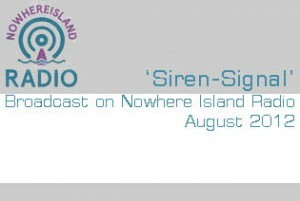 ‘Nowhereisland Radio is a temporary arts radio station that broadcasts live from and tours four separate locations in Plymouth, Devon. – which compliments the London 2012 Cultural Olympiad project Nowhereisland‘. The full set of sounds from my 2011 Siren-Signal installation on LightVessel 21 part of the International Lighthouse Relay will be broadcast as part of the schedule. Or go to my Soundcloud page to listen to the Siren-Signal sounds.